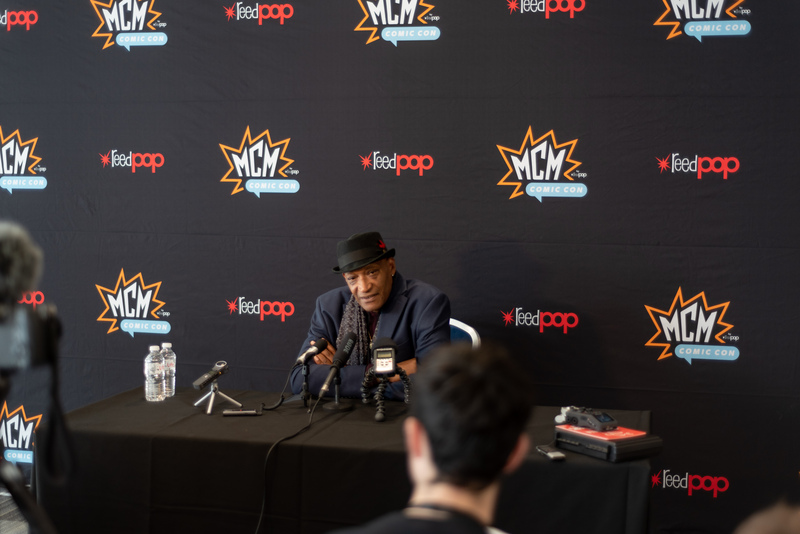 I was lucky enough to interview Tony Todd in his press panel at MCM Comic Con London. He’s always been on my list as one of my favourite actors. He has a way of being incredibly creepy. As a horror junkie he never disappoints in that genre. He has over 200 credits to his name and even though he is known for being in horror films he is so much more than that to include being an accomplished stage actor. Some of his most popular roles in movies and TV series are: Night of the Living Dead (1990), Lean on Me, Star Trek: The Next Generation, Candyman 1-3, The Crow, Star Trek: Deep Space Nine, The Rock, Hercules, Final Destination 1 – 3;5 , Hatchet 1 and 2, 24, Chuck, Transformers Prime (Dreadwing), Call of Duty: Black Ops, Lego DC Comics Super Heroes: Justice League vs. Bizarro League (Darkseid) , The Flash (Voice of Zoom) and Reign of Superman (Darkseid). As a lover of all things horror I first saw Tony in the film Night of the Living Dead which still remains a classic horror film for me. Next he scared all children with his performance in Candyman. Tony’s character, who was an artist and son of a slave, fell in love with a white woman and fathered a child in 1890 and his lovers’ father hired a lynch mob to set him on fire, cut off his painting hand and replaced it with a hook. Next he was smeared with honey where then bees attacked him and stung him to death. Candyman wanted revenge and he became a murderous soul with a hook for a hand. Yea I probably shouldn’t have been watching it at that age of around 11 but I loved horror movies. He had everyone scared to look into a mirror and no one would dare say his name five times in the mirror. One night my cousin and I did and we were sure we were going to die that night. Candyman is what made Tony Todd a horror icon. Here are some facts about Candyman. The bees used in the movie were in fact real and were bred specifically to appear on screen. Newborn bees were used, only 12 hours old, which had less powerful stingers. Tony was stung 23 times during filming and received a bonus each time it happened. He had his face covered with bees and in one scene had a mouthful of bees. There was no CGI there! He received a thousand dollars for each sting. The producers were worried that the film could be considered racist so they met with the NAACP to discuss this. The NAACP said not in any way and the rest is history. He has played bad guys in DC Comics and when asked which hero he would play he said he would love to be Green Lantern with Batman coming in a close second. Tony is doing a one man show about African American boxer Jack Johnson called Ghost in the house. Jack Johnson is the first African American boxing champion. Be on the look out for that project. When asked why he prefers playing bad guys he said: He said bad guys are more complex than so called good guys. He also said he just did some work on a new DC Comics project that might debut at New York Comic Con next year that he couldn’t reveal to us at this time. All he could say is that it was Justice League Related. He said he is mostly recognized for Candyman but that is not all he wants to be known for. He talked about working with Clint Eastwood and said he is an actor’s director and that he knows exactly what he wants and this comes from being an actor as well. He also said that the whole back story for Candyman was created by him. Tony recently did a film called Sushi Girl that he produced with Mark Hamill and I am looking forward to seeing that. When asked about actors he would love to work with Tony said he would like to work with Robert De Niro and his other dream actor to work with is Sidney Poitier. I asked him what type of struggles has he faced as an African American in the industry. He said that he wishes there was more diversity on the set. Especially early in his career. This is a huge problem and is a reason myself and Tony Aaron II are building Mystery Dinner Productions. Movies so white go beyond what is on the screen to the people behind the scenes that make the movies happen. Their isn’t enough diversity there and we plan on changing that. He talked about being fresh and constantly re-inventing yourself. Tony feels that you should pay attention to the climate and that America is upside down and it is important to feed on that to address these issues in your work. He thinks that Hollywood is slowly catching up to the fact that their are many people that have different faces and they all have different stories. Tony said he would not be silenced when people say actors shouldn’t give their opinions about politics and he wishes there was more harmony in the world. Tony is also working on a film about American baseball set in the Dominican Republic including 4 other films that are already completed. He will also be in the next season of the TV series Scream season 3 which I am a fan of. I’m looking forward to seeing that. Thanks for the interview.